NIR Roof Care, Inc.® > About NIR > Why Is Your Commercial Roof’s Care Our Concern? Why Is Your Commercial Roof’s Care Our Concern? Commercial Roofs don’t deteriorate all of a sudden. Constant exposure to the weather creates thermal mechanical movement, causing wear and tear. Preventative maintenance will prolong the life of a commercial roof. Most commercial building owners have many things to take care of, and their building’s roof is not high on their priority list. However, once there is a roof leak, the roof becomes their number one priority. They will then contact a roofing company, and the building owners often wind up spending a lot more money than they need to. Manufacturers have multiple factories running 24 hours a day with distribution centers all over the world. They have to sell roofing materials to stay in business. Although they position themselves as a solution with a list of licensed roofing contractors to take care of your problem, the fact is that they need to sell roofing materials or their companies will go out of business. 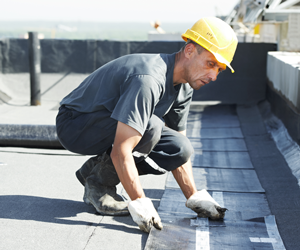 Manufacturers create roofing licenses with contractors and require them to buy materials. Consultants sell their professional services as independent third parties with expansive reports, yet do not fix your roof. They seem like they know more than the roofer. However, they work with manufacturers to promote their materials. Often, consultants are biased to certain manufacturers. They'll only recommend a small group of roofing companies to get bids from. This does not result in the best deal for the building owner. Old line roofers want to sell the highest price solution to make the most money. This is not the best way to buy a roof. They may have a service department and send out a foreman to fix a leak when he is not installing a new roof where the real money is made. A different guy comes back each time there is a leak, and it takes time for him learn about the specific roof. A Certified Roof Care Specialist is the answer to extend the life of your buildings’ roofs by maintaining them, not replacing them. Roofs expand with the heat of the day and contract when the sun sets. Your roof's thermal mechanical movement requires close monitoring, with Certified Roof Care Specialists performing the necessary roof care to keep the roof in as good condition as possible. “Your Roof ’s Care Is Our Concern” is what NIR is all about. Our Specialists take care of your roof, keeping it viable as long as possible. When the time comes to replace your roof, we give you the best value along with a new service agreement to care for your new roof. We will always take good care of your roof. We know that when we do just that, we are taking good care of you! You are the reason NIR is in business and we want you to know we will always put your money to its best use.